This isn't going to be some in depth post since this is an old fashion flavor. Let's just dig in. 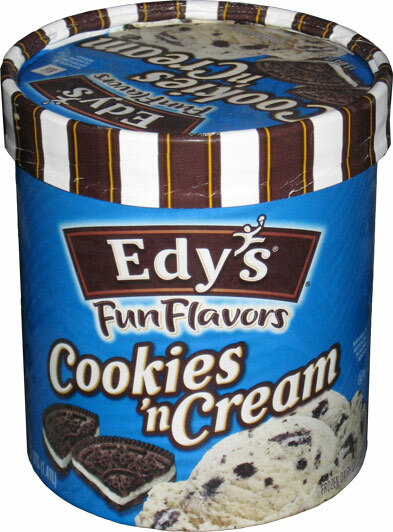 This is Edy's bright blue Cookies 'n Cream Fun Flavor which means it's a frozen dairy dessert. This is exactly how cookies and cream should look. 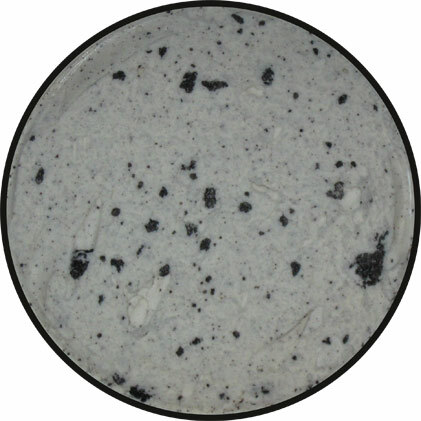 A nice wide range of cookie bit sizes and the base needs to have that faint gray tint to it. All the best CNCs look like this --- Ok, technically I don't see full cookie chunks inside like I do on the packaging, there's just seems to be cookie wafer bits, but I don't care. I just want this to deliver the flavor! It pains me to say this, but... I enjoyed this ice cream. You see, there is a very simple rule for judging a cookies and cream flavor. The rule is based on the name of COOKIES and (then) cream. "First you taste the COOKIES, then you taste the cream". The cookies are not decoration and they are not to be indiscernible (sorry, can't think of a better way to say it). The cookie flavor needs to pop, preferably with a cookie crunch AND THEN it all gets tied together by the base ice cream. Thankfully, this is exactly what we have here. A nice cookie flavored crunch in a fairly light weight base. I just don't have any major complaints here. Wow, you liked a reduced fat version of a dairy "dessert" You think you know a guy haha! I have it on good authority that in the next few months the Edy's Fun Flavors will be ice cream again, not frozen dairy dessert. The packaging will change. I would love for them to have a change of heart. They use to make good ice cream but fell prey to chemicals and cheap tricks. All the "Fun Flavors" will be switching to ice cream again. The packaging will be the standard "grand" style. Some flavors are out now. Also the limited flavors will be ice cream as well, except for girl scout regular with is out now.